A Strat for Friday #9-- With Strat-o-Sister Lisa Baker Too! Our Thanksgiving weekend Double-Feature combines a Strat-o-Sister and a Friday Strat! 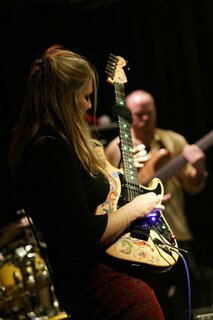 Lisa Baker plays a blend of music incorporating contemporary jazz-pop with fusion influences-- and counts Hendrix, Joni Mitchell and Allan Holdsworth amongst her heroes. Currently based in Nashville, Lisa has studied, traveled and lived in a variety of places, including LA, Amsterdam and Seattle. She also works with various members of the Wooten brothers, a music family rivaled, perhaps only by the Marsalis family. Lisa and her Strat have been joined at the hip throughout much of her music career. 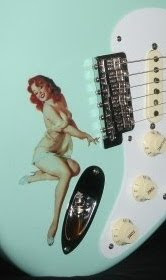 No ordinary Strat, Lisa's guitar merges aesthetic points with technical upgrades, making her instrument truly unique. In addition to the cool graphics and finish, other features include LSR tuners and fiberoptics. It's not hi-tech for the sake of being "hi-tech", however. It's simply set up to look and function the way Lisa wants it-- with an expressive, artist's flair.